I really do. English was one of those subjects I took to quite easily in school. I especially excelled in the language arts; spelling words correctly before I even knew what many of them meant and using them properly in sentences. It's odd really, because it seemed to come naturally to me. Mind you, my parents were both very good spellers, so perhaps it was a hereditary thing. Who knows. I remember in third grade, we had a contest to see which student could come up with the most homonyms and I won by a landslide. I even won several penmanship awards as young as second grade, beating out kids from fifth and sixth grade. My father was very artistic and ambidextrous, so again, could be the genes - not jeans. Mad Libs was my favourite game to play behind MASH and board games because of the adjectives and adverbs they asked for. I guess you could say I was an elementary overachiever. However, come high school, I don't know what the hell happened. Fast forward to the present day and I swear most of what I learned leached out my brain when I became a Mom. I guess all that knowledge oozed out to make room for my children's memories. I like to think I'm a cool, hip Mom (not to be mistaken for a cool whip Mom. I'm sure that's an entire entity all its own) who can roll with the punches; change with the seasons, if you will. However, there are two things in this complex system that make my eyelid twitch something fierce: bad texting (R U up 4 goin 2 get fud?) and awful grammar. Several months ago, my daughter told me that the shirt I was wearing at the time was, "Totes Presh". Uh. Come again, dear child? Totes Presh? As in totally precious? No. Nononononono. You're eight. I'm not ready for this. Then it hit me. It's gonna happen It's happening already whether I am ready or not. Both my littles are going to come up with their own language and as their Mother, I'm going to have to accept it and like it as my parents did for me. I just hope I stay way cooler than they were. Let's not forget there are those words that have been in the English language for years. Some make me want to jump out of my skin. Funny enough, this article in the Huffington Post is what sparked the fire to write this post. Words like moist, creamy, or ooze don't bother me in the least bit, even noob words like twerk roll off my back, but I know many that loathe them. I think it's the newer words that are created. I've been keeping a running list on my phone of words that make me want to pluck my eyebrow hairs out one by one. I'm sure there's more, no, I KNOW there's more, but for now, these are the bain of my intellectual existence. Man Cave - I have disliked this word the moment it became a thing and it makes me want to scratch. my. eyes. out. every time I hear it. There's a real estate company in my area with an agent standing next to a set of boxes labeled, Toys, Kitchen, Man Cave. Let's just say he's lucky I haven't defaced his billboards. I find it completely degrading. What happened to a simple family room? MAN CAVE. Grrrrr! *Beats chest*. *Scratches*. *Belches. * *No Women Allowed* (because women can't possibly enjoy things men do). No thank you. X years young - Unless you're over the age of 70, please don't use this phrase around me. Ever. Cutie Patootie - This phrase should have been cancelled the same time Rosie O'Donnell's talk show was. There are so many better words to use: adorable, gorgeous, lovely - even just plain ol' cute, but please don't insult the word by adding 'potootie' to it. Bahahahahaha - I picture a sheep in heat, jutting its jaw out, calling for a mate when I see this written. (Please refer to Pinterest). My foodie girls know this all too well. They now substitute that word with the sheep emoji when something's quite hilarious. I love them for that. YOLO - Unless this means "You Obviously Love Oreos", no. Just....NO. Frenemy - I have friends. I have enemies. I do not have friends who are enemies nor do I have enemies that are friends. If you do, you're probably doing something wrong. Yumsicle - "This lemon basil chicken is yumsicle!" NO. It's delicious, it's scrumptious, it's succulent. So many other words can be used. This would get you kicked out of my dinner party. Be forewarned. Amazeballs - I've been guilty of saying this, but enough. And awesome sauce in small doses, please. Ermahgerd - ERMAHGERD! ENOUGH ALREADY. Get In Ma Bellah - It wasn't funny back in 1999 when the Austin Powers movie was released, it's not funny now. I heard a woman in her 40s say it the other day and I cringed so hard I gave myself a headache. Cray or Cray Cray - Blaaaaaaaagh. Chillax - Chill and relax had a pretty messy divorce fifteen years ago. Stop reminding them of their unity. They don't like it anymore. Tarjay - It's TARGET. HARD G. You don't hit the bulleye's tarjay. TARGET. Kewl - *Punches you in the face*. Schmear and smear - GAG. A server in a London cafe when asked me if I wanted some schemer on my bap. I almost threw up. I didn't answer him right away, so he repeated it. "Schmear? Would you like schemer, miss?" 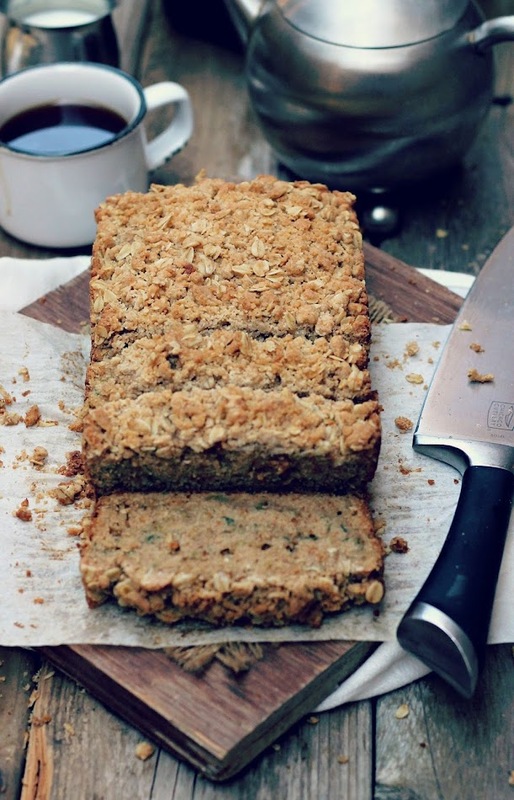 But this zucchini streusel bread? Not gross in the least. In fact, ermahgerd! It's ridonkulously cray cray, bruh. Get in ma bellah! Just please don't insult it by putting schmear on it. That would not be kewl. Preheat oven to 350 degrees F. Coat two 9 x 5 loaf tins with a thin layer of non-stick spray and line with parchment paper, allowing an inch to hang over. Combine all ingredients in a mixing bowl and massage together to form coarse crumbs; set aside. In a mixing bowl, whisk together flour, baking soda, baking powder, and cinnamon. In a separate mixing bowl, beat butter until creamy. Add in both sugars and mix until smooth. Incorporate eggs in one at a time before adding vanilla and molasses. Beat together until well combined. Add in dry ingredients slowly, beating only until incorporated. Using a wooden spoon, mix in zucchini. Batter will be thick. Evenly pour batter into prepared loaf tins. Do not top with streusel at this time. Place in oven and bake for 30 minutes. 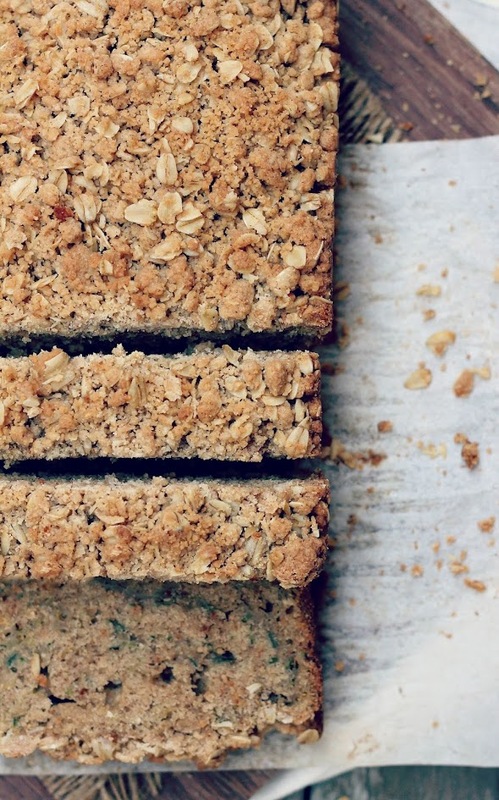 Once bread has baked for 30 minutes, add streusel topping and continue to bake for another 20-25 minutes or until toothpick inserted comes out clean. If you add the streusel too soon, it will dry out and quite possibly burn. Remove from oven and allow to cool. Cut into slices and enjoy! Yum! 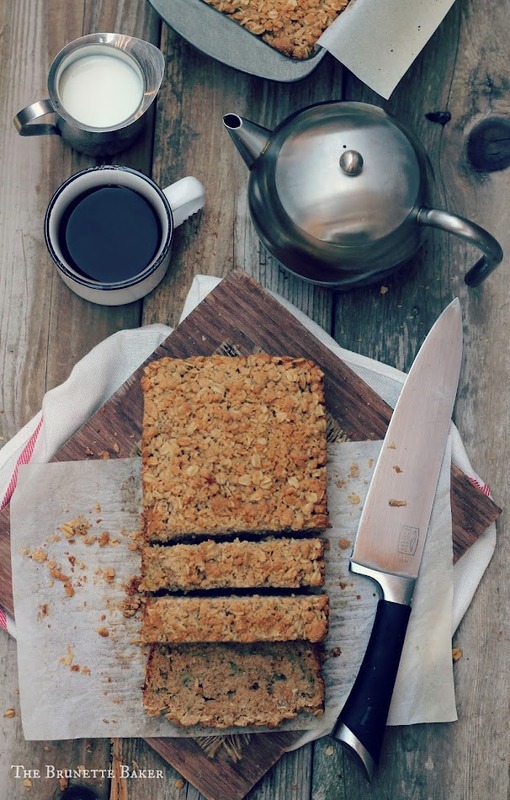 Love the streusel- it just makes everything better :) Pinning! You crack me up! But I completely agree when it comes to words that set my teeth on edge. Also, glad to see this recipe has a little molasses in it...more reason to give it a try. This is hilarious! Grammar phrases drive me nuts like when people say "I could care less". This implies you could care even less than you do! It's "couldn't care" less!!! For all intensive purposes is another one. I want to rip MY hair out. LOL. PREACH ON THE GRAMMAR! I also loathe bad texting like an ingrown toenail. Okay, this looks almost too delicious to eat. I love this idea! Streusel usually finds itself on muffins. This is pretty genius! Love the streusel on top and I loved this post. Bad grammar is becoming more and more of a common thing these days!! I fear for the youth of tomorrow.